The EFI Hi-Ram manifold line has a new addition for the 351W Ford application. 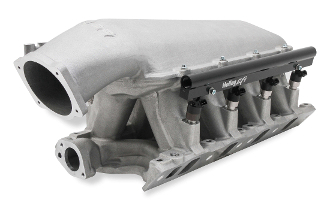 This manifold comes with a 105MM LS throttle body flange top, a 95mm LS throttle body top is also available. The runner length and tapered cross section design will perform well for a wide range of engine combinations. The engineering team also redesigned the water crossover passage to allow room for distributor phasing. Aggressive, bold, race–bred styling will make bad intentions clear for drag race, muscle car, marine, off–road, sandrails, pulling trucks, track, street–rod applications and more! Manifold is designed for a 9.5" deck height. Manifold width is 11.32". • Runner length and the tapered cross–section designed to perform well for a wide range of engine configurations • EFI fuel rails are machined for –8AN O–ring Fittings with passages large enough to accommodate high fuel flows and dampen pressure pulsations in the fuel system and come standard with EFI Hi–Ram kits. • Cast aluminum construction. Manifold is designed for a 9.5" deck height.